It may not be as well known as the pyramids, but Abu Simbel was one of my favorite travel experiences ever. This is an incredible ancient temple, thousands of years old, located in a remote corner of Egypt. Walking around these colossal pharaoh statues carved into the side of the rock feels a bit like you’re wandering back in time, or maybe you’ve just stepped into an Indiana Jones movie. The Abu Simbel temples were built in 1244 BC and they’re dedicated to Pharaoh Ramses II and Queen Nefertari. There’s a big temple for Ramses, and a smaller one for Nefertari. The point of this monument was to celebrate King Rameses II’s victory over the Hittites at the Battle of Kadesh in 1274 BC, which was believed to be one of the largest chariot battles in history. The temples were rediscovered by a Swiss explorer in 1813, but they had been buried by sand and no one was able to find an entrance until it was excavated in 1817 (how cool is that?). The entire temples had to be moved in 1968 as part of a huge project by UNESCO to save them from being flooded and destroyed by Lake Nasser. Today they sit on the west bank of the lake, but everything else looks exactly how it did 3,000 years ago. This one is a bit of a hassle to visit since it’s in a remote location, but I think it’s really worth it for such an epic experience. Abu Simbel is actually the name of a small village in southern Egypt, close to the Sudan border, and the temples are just a 15 minute walk from the village. To get to Abu Simbel, first you have to get to Aswan. EgyptAir and Air Cairo run flights from Cairo International Airport (CAI) to Aswan International Airport (ASW) that cost anywhere from $50 to $100 USD, one way. From Aswan, you can either drive or fly to Abu Simbel, depending on how long you plan to stay. See the full explanations below for more info. The most popular way to visit Abu Simbel is on a day trip from Aswan with a tour group. There are a number of companies offering Abu Simbel tours in this manner. The road distance is about 175 miles (280 km) and the drive takes 3.5 hours each way, for a total of 7-8 hours of driving. It’s a hassle, but again, there is no way to visit Abu Simbel without some hassle. If you’d like to stay a night in Abu Simbel to visit the night show (which is great, I’ll give more detail on that later), then the best option is to fly. Sadly the only airline route to Abu Simbel Airport (ABS) is from Aswan International Airport (ASW), so you can’t fly directly from Cairo. From Aswan to Abu Simbel, it’s a 45 minute flight with EgyptAir for $80 (one way). If you’re not interested in the night show, then definitely skip the flying and take a day tour by car instead (as above). It’s more time in transit, but it’s much cheaper and you won’t miss anything. After you arrive in Abu Simbel, the temples are just a 5-10 minute walk from the parking lot, or a 15 minute walk from Abu Simbel village. You’ll want to bring water, and avoid the souvenir shops on this street at all costs. Don’t even look at them. These were some of the most aggressive and crazy sellers I encountered in my 2 weeks in Egypt, which is saying a lot. One of the sellers followed me for 100 yards and sounded like he was going to attack me when I didn’t buy his souvenirs. Just ignore them completely and keep walking. I made the mistake of looking interested in one of the fridge magnets! The ticket price for Abu Simbel is 160 EGP ($9 USD) as of 2018. This gives you entry to both temples. If you want to take photos inside the temples, you have to buy an extra ticket for 300 EGP ($16.75). Neither of these are cheap by Egyptian standards, but you can skip the photo ticket if you don’t want to take pictures inside. I would recommend skipping it unless you consider yourself a photographer. The temples are amazing on the inside, but they’re dim and hard to photograph. If you do buy the photo ticket, remember to keep it handy for later on when the guards ask to see it, because they will definitely ask if they see you taking photos inside. As you walk down the hill, you will see the two temples about 300 feet apart. There’s a big temple for Ramses, and a smaller one for Nefertari. If you get here around noonish, you might even have the place to yourself. The main temple is the biggest and most impressive of the two temples at Abu Simbel, and it took almost 20 years to build. It’s easily the highlight of coming here. The temple is dedicated to King Ramses II, and you can see his likeness on the huge 70 foot tall pharaoh statues sitting in front. One of these statues is headless because it fell apart in an earthquake. The size of these statues is incredible, but you don’t really realize it until you get up close. Huge heads and legs. The scale is just massive, and you feel tiny. All of this was carved out of the rock, thousands of years ago. You can go inside the Great Temple, and there’s no extra charge for this. It’s very worthwhile. There’s a sign by the door of the temple saying you can’t take photos inside, but if you bought the photo pass mentioned earlier then you can ignore this and click-click away. Just remember to keep your photo pass handy for when the guards ask to see it, because they will definitely ask. The first thing you see on the inside is a row of statues with their arms crossed, which is supposedly meant to represent either Ramses II as a deity or possibly Osiris, an Egyptian god of the underworld. Most of the carvings on the inside show different scenes from the Battle of Kadesh, and there’s one huge picture of a chariot in battle. Awesome! Located just 300 feet from the main temple is a second one dedicated to the Egyptian queen Nefertari. This one is not as huge and impressive as the main temple, but it’s still pretty cool in its own way. The front of the temple has a row of 6 statues of the king and queen, along with some mini-statues of the princes and princesses. The 6 main statues are over 30 feet tall, so they’re bigger than they look in pictures! This facade is also covered with cool hieroglyphics carved into the rock — pictures of moons, birds, dragonflies, beetles, and other weird shapes. You’ll see a sign by the door again saying you can’t take photos inside, but if you bought the photo pass mentioned earlier then you can ignore this and go ahead. The inside of temple #2 is interesting too. It has 6 square pillars and the walls are covered with Egyptian deities and royal figures. The dark corners of the room are artificially lit, so if you bought the photo pass earlier then you can try to take some neat pictures. The wall on your right (as you enter) shows King Ramses II smiting an enemy of the Egyptians, while the queen watches. The biggest reason to stay a night in Abu Simbel village is to see the Sound & Light show at the temples after dark. Every famous place in Egypt has a night show like this where they light up the monuments with a projector and tell stories about their history. The show at Abu Simbel starts at 7 PM and lasts about 45 minutes. The price is normally 150 EGP ($8.50) per person, but the show only runs if there are at least 7 tickets bought. That means if there are less than 7 people attending, you’ll need to pay extra to make up the difference. I was asked to pay 250 EGP, but it turned out there was a group of at least 20 people (I didn’t find this out until I walked down the hill and joined them), so in retrospect I was overcharged by almost double. This type of scamming is pretty typical in Egypt. The narration for the show is done in whatever language most of the visitors speak (my group was mostly Spanish), but you also get ear buds to listen in your own language. I really debated whether I wanted to stay a night in Abu Simbel village just to see the night show, because the airfare and other costs start to add up. But it seemed popular and the pictures looked great, so I decided to go for it. These shows range from gimmicky to amazing, but Abu Simbel falls in the amazing category. It’s pretty much known as the best Sound & Light show in Egypt. The only thing more amazing than seeing these huge statues in the day time, was seeing them lit up at night while listening to stories from their ancient history. It was the highlight of my trip to Egypt, and probably one of the best travel moments I’ve had anywhere in the world. 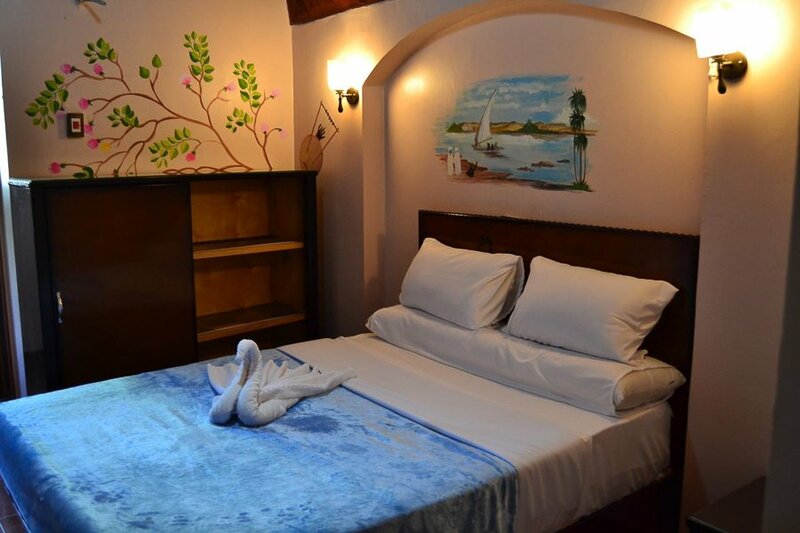 If you do decide to stay a night in Abu Simbel, there are not a lot of options for accommodation. Your best bet is probably Tuya Hotel. The facilities were nothing spectacular, but the WiFi was pretty good, and most importantly the hotel is only a 5-10 minute walk from the temples. When Is The Best Time To Visit Abu Simbel? Egypt has an arid climate, so it’s hot and dry year round. 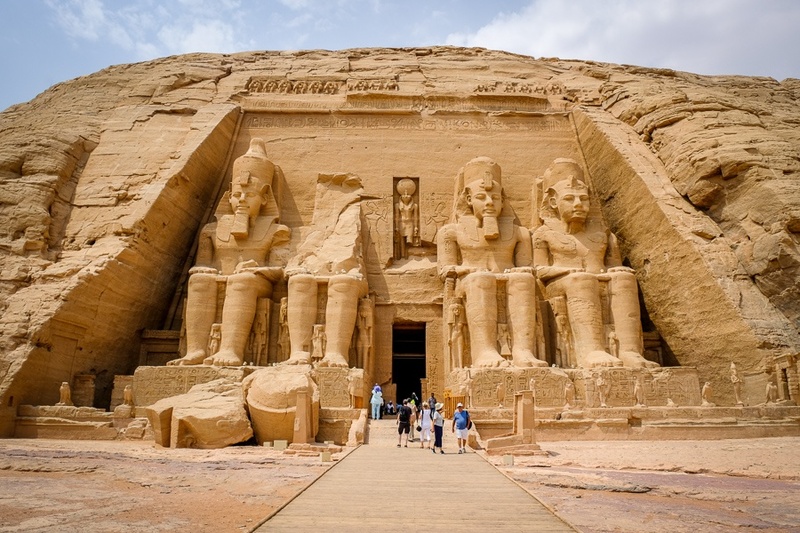 The coolest months are from December to March, and this is probably the most popular time to visit Abu Simbel, but honestly any month in the spring or fall would also be fine. I visited Egypt in September, and the heat was bad at times, but I didn’t think it was too much of a problem at Abu Simbel. Even at its worst, Egypt is not nearly as hot as some nearby Middle Eastern countries like Qatar or the United Arab Emirates.